Last night the Bellevue school district had one of a series of 'roadshow' nights that they do, to talk to parents and the community about stuff going on in their schools. Last night's event was about the use of technology in schools, and since the twins will be in Kindergarten in the not so near future, I thought I'd attend. I had extremely low expectations for two reasons. First, because generally speaking, we are priveledged enough to work in an industry of very smart people, the caliber of presentations 'out in the real world' is often lower than that which I'm used to (e.g. city council meetings, homeowners association meetings, etc, are normally like pulling teeth to me). Secondly, because my history of use of computers in schools has been that they are outdated, underused, and that the staff is usually so inept at using the technology, in comparison with the students, that it ends up being relegated to the simplest uses, or in dedicated 'computer class' type uses. Their whole curriculum is online. The publicly viewable one (here) is just high level, but the one behind the firewall that the teachers use has every lesson, every exercise, and all that will be parent-accessible within the next year. Even just the high level helps parents better understand what their kids are working on, but long term, it means things like report cards are obsolete because you can get a snapshot of your kid's progress as often as you want, instantly. 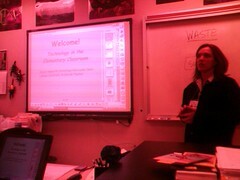 Smartboards installed in every classroom. At first I thought "ok, it's a high tech blackboard", but these projector/touchscreen combinations are being embraced by teachers who are devising custom lesson exercises that use the technology. I saw one teacher demonstrating her dynamic editing of a sample book report, circling and dragging and dropping sentence fragments to let the class try different approaches, saving off two different versions and putting them side-by-side to compare, etc. At the very least, it's a massive timesaver (no more waiting 5 minutes for the teacher to write out the lesson on the board), but more importantly, it adds interactivity to the exercises. All of these custom lessons and exercises that teachers come up with, they can save up on the web as custom materials for that class unit, and then any teacher teaching that unit can grab it, improve on it, and use it (think of a giant version of this). They gave me an example of how teachers are using this between units, where an art teacher one day decided they'd do art about their science topic, went over and looked at that day's science class exercise, which was about bugs, and said "ok, let's take those bugs you saw in your last class and see if we can do drawings of them in nature", borrowing the materials from the other class as a starting point. Teachers can choose to record whole lessons, or just segments or excercises, and put the whole video on the site. Once parents have access (next year), they'll be able to better help kids with homework, catch up from sick days, etc. 'Student Response System': Think of TV game shows "everyone in our studio audience, use your buttons to vote NOW!". Teachers can turn any question into an impromptu survey, displaying the results on the screen ("ok, only half of you got that right, maybe we should go over that again"). Kids can click their answers in from their desk. Document cameras, so that if a teacher sees a student taking a novel approach at solving a problem during an exercise, she can grab the document, put it up on screen instantly and say "let's all look at how Susie did this...". Also useful to demonstrate details of an art or science project without the 20 kids crowded around the teachers desk. I even saw a new music class they are adding to the curriculum in which they use SW to do composition, both of the traditional variety, as well as using Fruityloops to have kids do their own electronica type stuff. Overall, I was really impressed. With my generation's teachers, I remember feeling that they were getting access to technology but had no idea how to use it (remember schools saying "we are getting computers this year." but there was no talk of implications?). In contrast, I felt that with these teachers and administrators, there was a palpable sense of passion and excitement about the opporunity before them; that they'd just started to grok the possibilities before them, and couldn't wait to put it to use and push the system to it's limits. I'm fully aware that this level of tech in public schools is probably the exception, not the norm. It can't be just coincidence that it falls within the Microsoft campus 'blast radius of money'. Regardless, if this type of thing proves effective, other schools will adopt the same technologies and approaches. It improves the speed and effectiveness of teaching which at the end of the day is a good thing. More importantly, it is, more than ever, empowering teachers to contribute to one another's teaching. It's putting teachers behind the wheel... and this schoolbus is supercharged. That's awesome! Nice to see that all the local tax money from Microsoft millionaires is going toward something good. Let's not forget that those SMART boards are a Canadian product! Of course, I wonder how many SMARTboards can be found in lower income districts? I believe the answer would be none, Bob. God, I would've killed to have this kind of interactivity back in school. I kept to the tech savviest schools I could, and half the teachers were still afraid of the things. And I remember the first time I saw a SMARTboard, probably 6 or 7 years ago now. Lots of potential, if used well. I hope that this trend of interactive, and iterative (almost game-like) teaching continues as my generation gets into the schools (as teachers this time) and the technology becomes cheaper and available for everyone. Good stuff. Makes me want to be back in school.